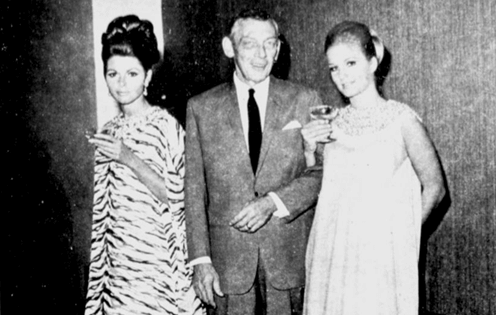 In the 1950s and 1960s, an American entrepreneur by the name of Linden Edward Johnson put the HK garment industry on the global map through his Mandarin Textiles (萬壽) and its highly successful Dynasty Salon line of women’s loungewear, dresses, blouses and men’s bathrobes and pajamas which was sold in all the major department stores in the US (the first HK brand to achieve this and not many since), US military bases across Asia and its own stores in HK and London. Johnson was also known for improving labor conditions in HK and was a founding director of Tai Ping Carpets. Born in Wichita, Kansas in 1914, Johnson worked for Skelly Oil in Kansas managing a gas station while he was in college and worked with his father in the insurance business after graduation. A member of the Kansas Air National Guards, he joined the Flying Tigers as a pilot in the China-Burma-India theater during World War II and two of his brothers also served with the US military in the Pacific. In 1948, he was discharged from the US Air Force as a lieutenant-colonel and chose to stay in the Far East. Originally, he planned to work for an American multinational but when he failed to land anything, he became an entrepreneur and started his own export business in Shanghai. He was approached by Jimmy Ling (林紹明, 1915-1957), a Chiuchow Christian merchant with some Swatow lace and through his connections in the military, Johnson managed to sell the goods in US military bases in the Philippines and Okinawa. The success in the trade resulted in a friendship and the two became business partners. When the Communists took over Shanghai in May 1949, Johnson was trapped in the city for 11 months before he managed to board the “SS General Gordon” to Hong Kong.He arrived in Hong Kong in 1950 with a suitcase with no cash and started a small factory called Mandarin Textiles (incorporated in May 1951) on Castle Peak Road in Kowloon with Ling, hiring low cost refugees to make garments for sale to US soldiers stationed in Japan. During the Korean War, the business took off thanks to the massive influx of US soldiers in the region. Committed to develop their own brand in the high end market in the global stage, Johnson and Ling started theDynasty Salon label and opened its flagship store at the Peninsula Hotel in Kowloon in 1952. The duo hired designer Dora Sanders to design clothing sized and styled for Americans who were traveling in Asia and also hired Dorothy (“Dot”) Prentice from Australia as managess of the new store. After three months of preparations, the flagship store opened with 400 guests at its opening party. The store’s decorations and designs were rather unique, with red Chinese moon door and a fitting room lined with grey leather walls. Within months, the new store caught the attention of major US department stores such as Saks Fifth Avenue and Gimbel and orders were coming from the US. 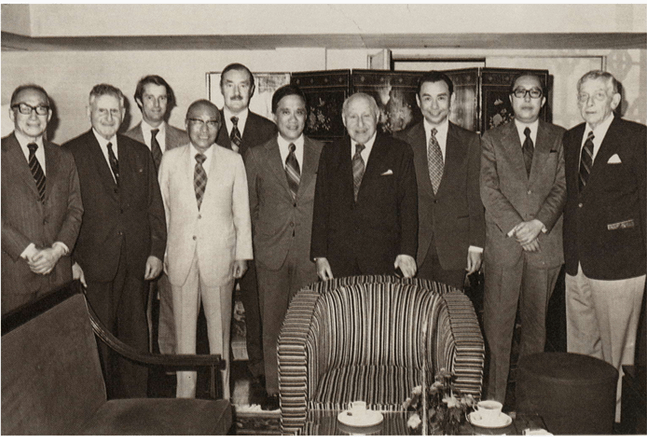 A key partner which helped Mandarin entered the US market was Products of Asia (POA), a firm operated from 1955 to 1967 by the oil scion John D. Rockefeller III (1906-1978) to promote Asian products in the US. Rockefeller was quite satisfied with Dynasty products which he described as “have the inspiration of the Chinese background, the Chinese design. And it took a very considerable adaptation of that design to meet American demands and needs. The material, of course, reflects the Oriental beauty, the colors were based on the Oriental, and even the cut of the clothes to a certain extent reflected the Oriental”. Aside from Mandarin, POA also worked with another Johnson’s other business venture – Tai Ping Carpets in the late 1950s. Another admirer of Mandarin was Russel Wright (1904-76), a famous industrial designer working for the US State Department’s International Cooperation Administration who appreciated Mandarin’s combination of American design and marketing with Chinese flexibility and skills. At a time when sweatshop exploitation was common (seven-day, 60-hour week) in HK, Johnson stood out from most employers by offering 44-hour week (5.5 days for office workers and 6 days for factory workers), top wages, recreation rooms, catered meals, English classes, free insurance, hospitalization and health benefits, a pension and retirement fund for employees. According to the Parade cover story in 1967, Johnson“made the word “American” synonymous with “fair, honest, and just” in HK labor circles. He also continued to share half of the firm’s profits to Ling’s widow and retained many of Ling’s relatives at the firm but according to the memoir of the airfreight pioneer Lawrence Dunn (鄧河, father of child star turned magazine publisher Peter Dunn and TV presenter Patrick Dunn) who worked at Mandarin, the relationship between Johnson and the Ling relatives was difficult and so in 1960,Johnson invited Milton E. Petrick, a former pilot for the US Navy during WWII to join the firm. By 1959,Mandarin’s products were sold in over 595retail outlets in America includinghigh end department stores in major US cities such as Neiman Marcus of Dallas, I. Magnin of San Francisco,Marshall Fields of Chicago and Lord & Taylor of New York which were given six months exclusivity on new designs before they were make available elsewhere. In Hong Kong, the Dynasty store at the Peninsula became a magnet for visiting VIP wives who had to be dragged away. Its line of clothings was also sold at the Fleet Club in Wanchai and when the Hong Kong Hilton opened, Dynasty opened a branch there. 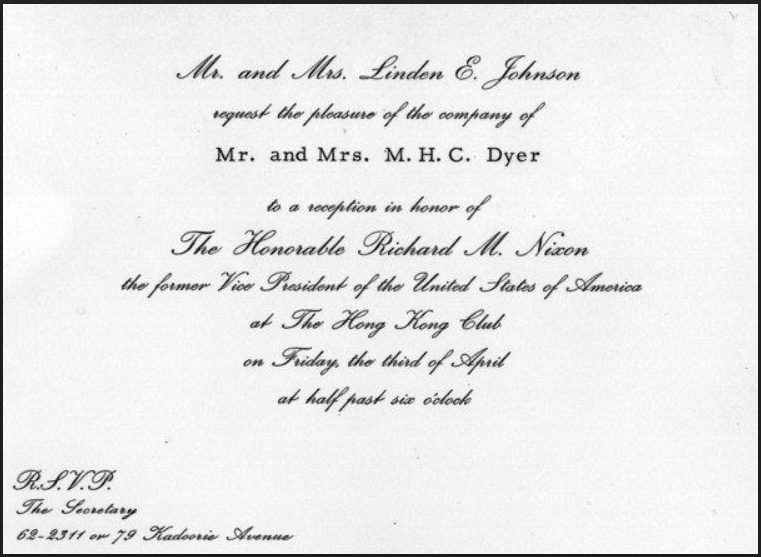 In 1961,Lyndon B. Johnson, then Vice President (later President) of the United States visited Hong Kong as part of his Far East tour, during which he visited Dynasty Salon and bought 82 silk shirts at US$4 apiece as mementos for his associates, staff, the 15 members of his plane crew and 40 newsmen traveling with him. He also met with Linden Johnson, fascinated by the similarities of their names. President Johnson’s daughter Luci Baines Johnson Robb was also a fan of Dynasty and at the White House farewell gala in 1969, she wore a black and white zebra patterned chiffon gown which she purchased at Dynasty in HK. The dresses sold by Dynasty had price range of US$70-$400 and according to competitors the firm was at least doing US$5 million a year in sales by the mid-1960s. To keep the line fresh, Dora Sanders came up with 15 new silk and brocade patterns per year with names like”Cherry Blossom”, “Ivory Blue”,”Sing Song” and ”Garland” andMandarin’s stockroom had over 500 designs and each design had eight different colors. In 1964, Dynasty hired Urleene Chaplain as designer and she started using materials other than Asian silk.According to Johnson, his preference was for the highest quality silk from Europe rather than using lower cost Japanese silk as his focus was in quality rather than quantity. In 1966,Mandarin entered the European market by hiring Italian designer Patrick de Barentzenand opened its first overseas branch in London. The same year, a partnership called Century Trading was formed with William J. Crum (1920-1977), a controversial American businessman in HK with ties to the US military, to distribute Dynasty fashion in American military post exchanges in South Vietnam – this will drag Johnson and Petrick’s names into the US Senate investigation of Crum and kickbacks involving high ranking officers in the early 1970s but neither Johnson nor Petrick were found guilty of any wrongdoings. 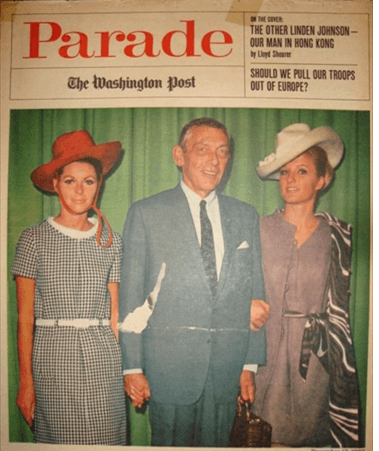 Linden Johnson and two models on the cover of Parade in December 1967. 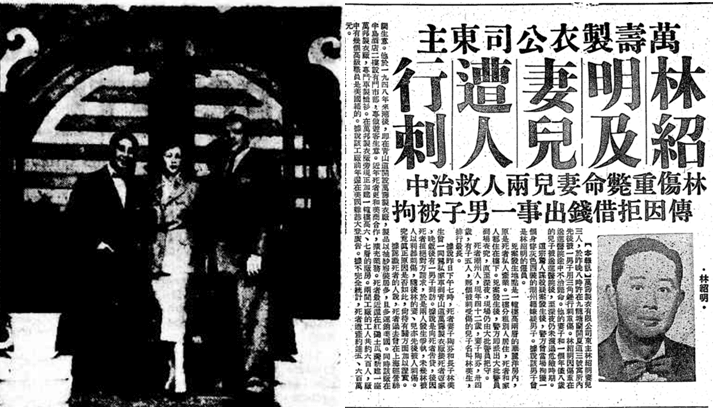 In October 1967,the Federation of HK Industries organized the first Festival of Fashions (now HK Fashion Week) and Milton Petrick of Mandarin was chairman of the festival’s organization committee. In December, Linden Johnson was featured in a cover story for Parade, the weekend magazine available in most Sunday newspapers in the US which described him as “the other Linden Johnson” and “Our Man in Hong Kong”. In 1971, Johnson decided to re-develop the factory at 60-66 To Kwa Wan Road to a 265,000 sq ft, 14 story tall industrial building – the Dynasty Building – equipped with special elevators and warehouses to handle air freight to the Kai Tak Airport nearby. 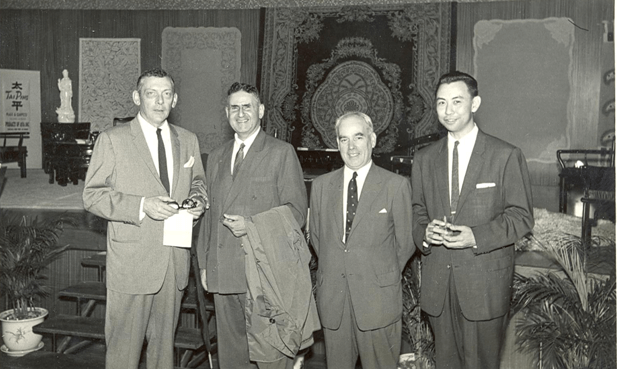 Linden Johnson (first from the left) with Horace Kadoorie (second from the left) and Anthony Yeh (first from right) in the early years of Tai Ping Carpets. Source: HK Heritage. After Mandarin, Johnson remained on the board of Tai Ping Carpets until the 1980s.Aside from working with the Kadoories at Tai Ping, Johnson and his wife Joan and daughter Kitalso lived on 79 Kadoorie Avenue while they were living in HK. He also served on the board of American International Assurance, the local affiliate of the US insurance giant AIG which traced its roots to Shanghai and whose executive KK Tse was also a longtime director of Tai Ping Carpets. This article was first posted on 1st October 2018.